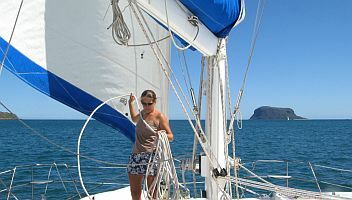 We've had a bit of an adventure - when we first arrived from the Seychelles we spent the night in Rantabe Bay (12°27.5'S 48°45'E) but it's rather unprotected and got a bit rolly. 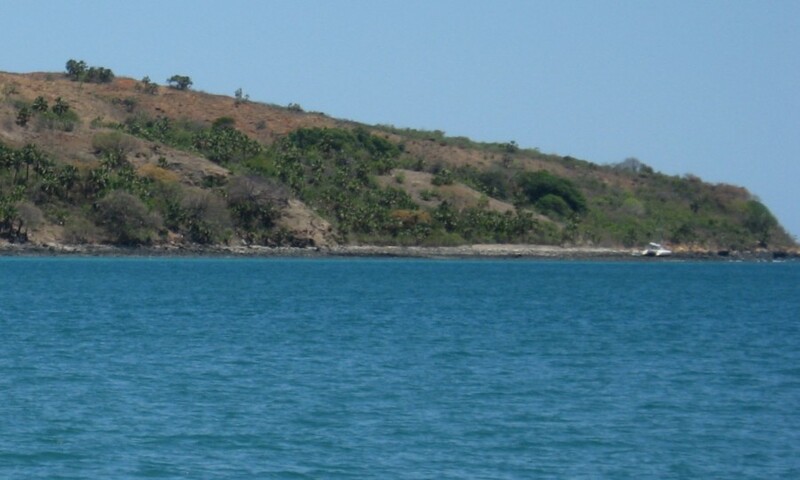 So we left the next morning and had a nice 30 mile sail south to Mitsio Island at 12°54.5'S 48°35'E, an arid but pretty and well protected bay with a nice sand beach and a couple of very primitive grass-hut villages. 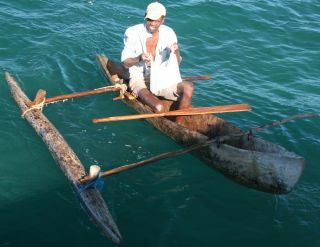 We were visited by several people in dugout-canoe outriggers wanting to sell lobsters, squid, fish, fruits, and veggies. At the time we had no local money, but we had lots of T-Shirts and other tradables for just this sort of occasion, and the locals seemed very happy with this. 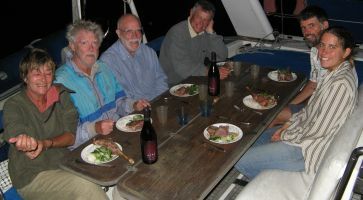 We had the whole bay to ourselves until a French cruising boat arrived just at dusk. But in the morning we saw that a third boat had arrived in the night - and missed the bay! 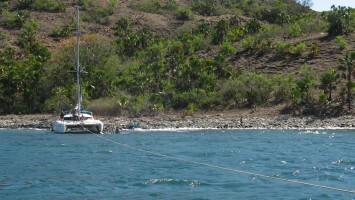 They were high and dry on the rocks at the NW head of the bay, a small Fontaine‑Pajot "Athena" catamaran of about 37' (11m). 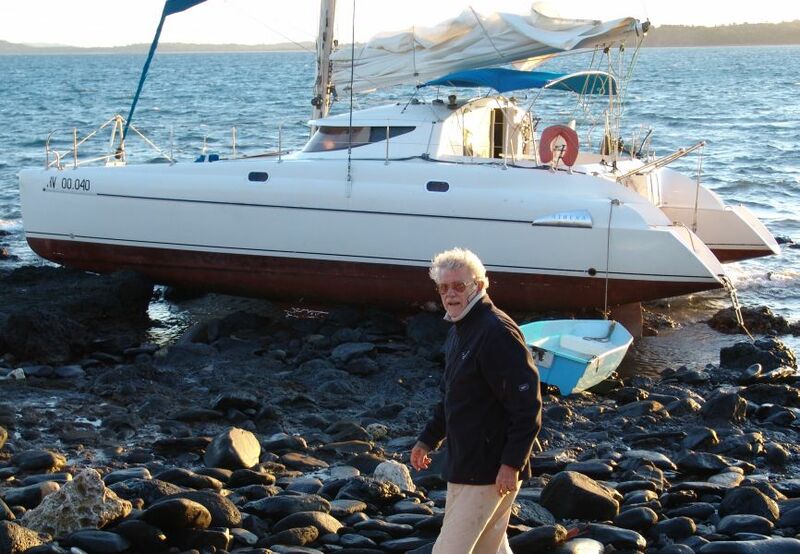 We quickly dropped our dinghy and motored over to find 4 French charterers and a local skipper, and surprisingly little boat damage, given all the rocks. 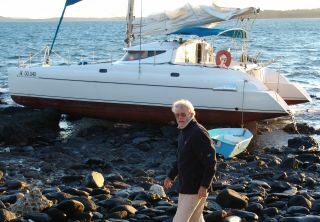 In fact, one sail‑drive had been pushed up into the boat, tearing the seal, so it had a leak on port side. Otherwise, the hull was a bit scratched-up but sound. They'd arrived at night, just at low tide, and the local skipper had been drinking all day. When they first hit the rocks off the point they'd thrown out an anchor but it hadn't held. 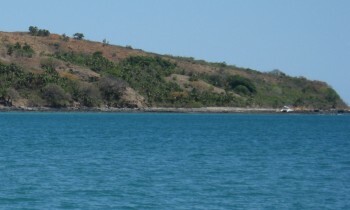 The wind and rising tide had pushed "Pimienta" inexorably up on the rocks, terrifying the French charterers. The skipper actually implored the French charterers to get in the water and push! - a request they intelligently ignored. The 4 French charterers, 3 men and 1 woman, all in their 60s, were understandably distraught. Pimienta had been pounding on the rocks all night and nobody had got any sleep. 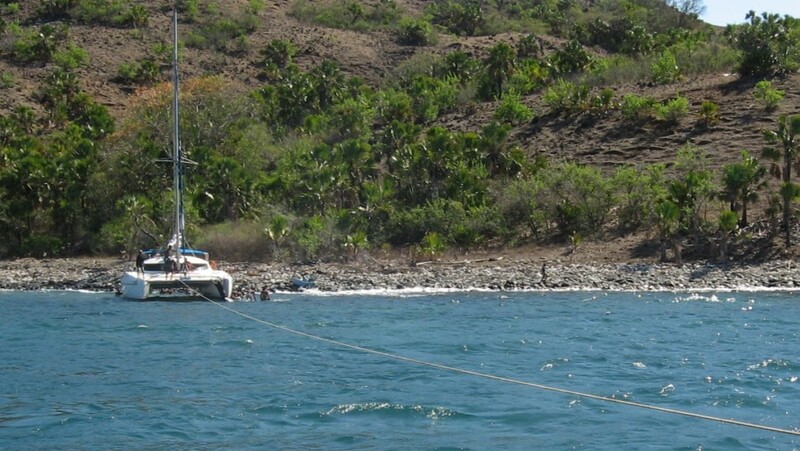 So Jon took their luggage and the oldest man off the rocks in our dinghy and onto Ocelot, while the other charterers walked the rocks to the beach at the head of the bay. We asked if there was a phone in the village and a barefoot man told us to come with him. He led us out of the village and across the island, eventually coming to the top of a small hill. It was about here that we realized that he was not taking us to a remote phone-booth, but to a hill where we might be able to get a mobile-phone signal. But our phones showed no signal and we couldn't connect so we walked back to the beach. As we walked through the very rustic village, we realized that the French would not want to stay there, so we offered to let them stay on Ocelot and we could take them back to Nosy Be island the next day. They enthusiastically accepted our offer. 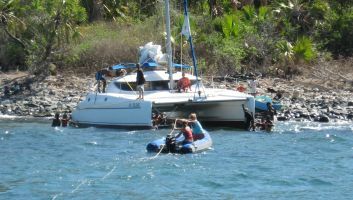 Unfortunately, once we got Pimienta off, the line went slack, and although Jon had told the French charterer who was tending the line not to let that happen, he did and it got tangled in our port-side propeller. There followed some high-adrenalin moments while Jon screamed and shouted from the helm while Sue jumped in the water to free the line and Amanda used the dinghy to keep Ocelot pointed out to sea. In the end the wind pushed us into about 10' (3m) of water before Sue got the line clear. Sue and Amanda took Ocelot back to anchor while Jon strapped the dinghy alongside Pimienta and drove her onto the beach in front of the village where the skipper wanted to work on her. Then a nice lunch with lots of good home-brew beer and a siesta. Since we hadn't seen a grocery store in over 2 weeks, we bought a butchered goat(!) from the village so we'd have something to serve the charterers. The women got together and eventually decided to roast it for dinner with lots of garlic and seasonings - flavorful but a bit tough in spots. In the meantime, we've decided to do a 3-4 day tour of northern Madagascar, but those adventures are for another newsletter.